The Genesis sample return capsule after impact in Utah. The science canister from the Genesis spacecraft has been transported by helicopter from its impact site at the U.S. Army Dugway Proving Ground in Utah to a holding area next to a specially constructed clean room on the Army base. 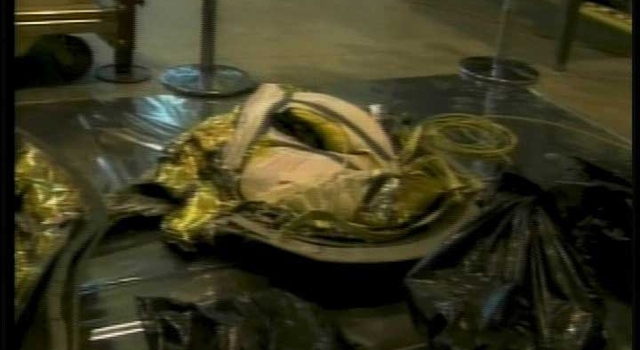 The foil wrapping will be removed from the canister and dirt will be brushed off before the canister is moved into the clean room for analysis of the contents. For information about the Genesis Sample Return Mission on the Internet, visit http://www.nasa.gov/genesis. For background information about Genesis, visit http://genesismission.jpl.nasa.gov.